For our third interview, our pal Obenjo Kusanosuke has taken the time to interview talented artist and author, Sylvain Jolivalt. Enjoy, and feel free to post questions for Sylvain in the comments. Today we are fortunate to have author Sylvain Jolivalt, our SA Citadel Forum’s own “Akaguma” with us for a special interview, and believe me, we’re in for a treat. Besides being extremely knowledgeable about Japanese history and culture, Sylvain is an accomplished artist, author and yokai expert. These skills are beautifully combined and represented in his book Esprits et créatures fabuleuses du Japon: Rencontre à l'heure du bouef , available from Amazon.co.fr. Also, be sure and check out Sylvain’s website at http://www.shiruban.new.fr and his blog at http://shiruban.over-blog.com where you can see much of his terrific artwork. Obenjo Kusanosuke (OK): Sylvain, welcome to my little interview chashitsu. It is a real pleasure to have you here. Sylvain Jolivalt (SJ): Thank you very much! It’s a pleasure for me too. It’s still a bit unusual for me to be interviewed. OK: I thought we’d start this out by asking you one of my basic questions—how did you become interested in Japanese history and culture? What drew you to it? SJ: I couldn’t say it’s thanks to japanimation, as when I was a child, I didn’t even know those cartoons took place in Japan, or even were made in Japan. Actually, I became interested in Japanese culture thanks to… American comics! Since I was eight, I was a great fan of Marvel comics. I once read a story about the X-Men that took place in Japan, and found out that my favorite super-hero (Wolverine) could speak Japanese. That looked real cool. A few years later, I got into Frank Miller’s Daredevil (with a lot of ninja stuff), and then Miller’s Wolverine in which I learned my first words in Japanese, which then motivated me to buy a “learn-it-by-yourself” Japanese handbook. At this time, I was also fond of every ninja movie (like the ones featuring Shō Kosugi) that were released on VHS. , and of course, Shōgun could be watched on TV. Since then I began to read everything about samurai and ninja. In Dungeons & Dragons Oriental Adventures role-playing game I first read stuff about yōkai. Then, reaching university, I started to more seriously lean the Japanese language and culture. OK: I can’t help but to admire your artwork. 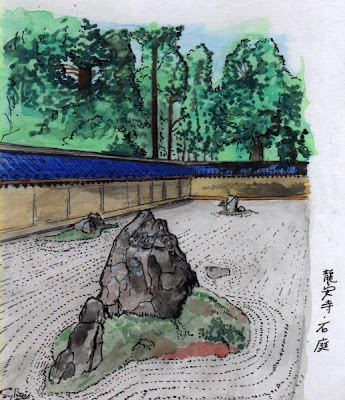 I think you’ve done a fabulous job of capturing the essence of traditional Japanese landscapes and objects in your work. I think your rich knowledge of Japanese culture really shines through in your work. Your illustrations have a nice modern and sappari (さっぱり)—refreshing—feel to them. At what point did you want to start blending your skills with the pencil and pen with your love of things “Japonais”? SJ: Thank you. Actually I started to draw more or less Japanese things for quite a long time ago. But it’s since I began my comic book project six years ago that can be seen on my site, that I tried to stick closer to historical reality. 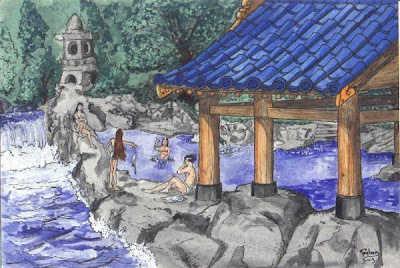 OK: Where are your top three favorite places in Japan that make you want to pick up a pencil and paper and start sketching when you are there? SJ: Good question. I much liked to visit Mount Hiei. Not only the principal buildings of the Enryaku-ji, but also the forest between them. As we were most of the time all alone, we felt like we could anytime run into a tengu. I also like traditional looking streets like the ones in Takayama, and, of course, castles. The very first one I visited was Matsumoto-jō which impressed me very much. OK: And at what point did you want to combine your artwork with words and write a book about yōkai? And why yōkai? What’s the allure of these mythical Japanese creatures to you? SJ: fifteen years ago, I worked as assistant and interpreter for a Japanese geography professor who came in Alsace to study rivers, groundwater, and so on. When visiting different spots in the area, I always told him about local legends, which inevitably made him think I was much interested in myths and tales. He then offered me my very first book in Japanese about yōkai, Mizuki Shigeru’s yōkai dictionary. 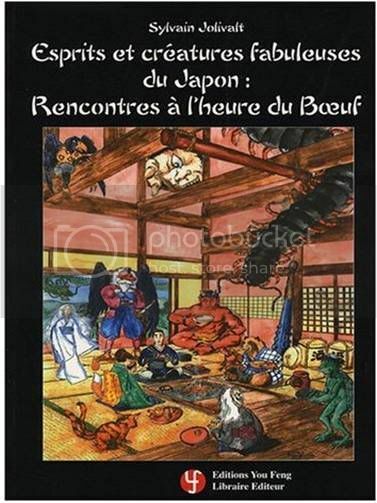 As there wasn’t any book about Japanese ghosts and goblins in French, I thought it could be interesting to write one. Once in Japan, I found out there were a lot of books about them, So, I came back in France with my luggage plenty full of these books. I then compiled and translated every data I could find. As I didn’t really know how ancient pictures found in those books were copyrighted, and as I liked to draw all sorts of strange creatures, I found it easier to illustrate the whole book all by myself. What I find interesting in Japanese yōkai are their close links with geography and history-- that historical figures have met them, or that there still are signs of their presence. That’s funny! OK: It seems there has been a recent rise in the amount of publications on yōkai both in Japanese and other languages over the years. The series of Shabake books by Hatakenaka Megumi about friendly yōkai who help the young heir of an Edo-period shipping company has been incredibly popular over the past few years and was even made into a television movie last year. Why do you think the fascination with yōkai has endured over the years in Japan and now in foreign countries? SJ: It seems that this taste for fantastique seems to be a common trait in all our country, may it be through movies, books or comics. And with this wave of interest in Japanese horror movies, manga or anime, there are more and more people interested in yōkai. Hence my book. OK: So do you think yōkai are just as relevant in today’s Japan as they were during, say, the Edo period? SJ: I feel that Japanese are a bit more superstitious than Westerners can be. I was somehow amazed when a Japanese friend of my wife seriously advised her not to take photos in a cemetery because ghost might appear on pictures. Or I have a friend who felt really uncomfortable merely with looking at demon [inō[/i] masks. Maybe was it the same a long time ago. OK: Can you please talk a little about your three favorite yōkai? This is a karasu-tengu (raven-mountain-goblin). They are usually mischievous toward humans, but when they find a worthwhile soon-to-be hero, they may teach him secret martial arts techniques. When I decided to talk about the kūbi no kitsune (nine-tailed vixen) in my book, it was first to show to all those Naruto fans that she did exist before the manga. I then found out that she is a very interesting evil creature that has a long history. She caused the fall of two Chinese dynasties and even traveled to India, before trying her luck with the emperor of Japan. But there, she’d been quickly unmasked by an onmyōji, and hunted down by top-class archers. She had been caught in the shape of a rock that can still be found nowadays. OK: I recently came across this ukiyo-e by Yoshitoshi. Here, we see a person defending himself from kappa by…aiming a “gas bomb” at the little green guys. Is this really an effective strategy for trying to keep from getting one’s shirikodama? I just need to know if it is a good thing to always bring some Satsuma imo and beer with me just in case I’m headed down to the river and am confronted by a kappa looking to rip into my bowels. 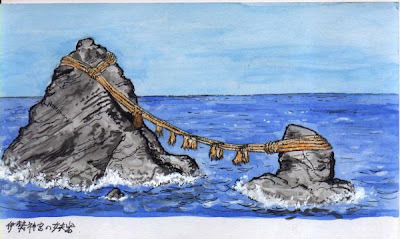 SJ: This can be a good technique that may prevent kappa from getting one’s shirikodama. Otherwise, you can bring your pet monkey… monkeys are supposed to be their sworn enemies. Or you can offer them cucumbers… kappa are really fond on them. OK: I know I’ve asked this before on the SA Citadel forum, but I’ve got to ask again. Are you planning on having Esprits et créatures fabuleuses du Japon translated into English? SJ: I’d like to. But my looking for a publisher hasn’t been this fruitful so far. I should insist a bit more. OK: Let’s talk about a little about the study of Japanese history in France. I know you are very much interested in samurai history, their weapons and their armor. Is the study of samurai military history particularly popular in France? Is there a wide selection of books available books in French covering all the areas of Japanese history? Who are the more prominent scholars of samurai history in the French speaking world and what books opened the “samurai universe” to you? I suspect there is a rich collection of material available. SJ: The military history of samurai warfare is not particularly studied in France in this detail. There are some nihontō aficionados who happen to write books about weapons. As far as I know, there are a lot of studies about contemporary Japan, but not much that I can recall about earlier periods. I’ve read a good book about the Kamakura period by Pierre Souyri. Francine Hérail’s books are also interesting (both of them were my teachers when I studied at Langues’O). OK: Who are your favorite Japanese history scholars outside of France—such as in Japan, the UK or the US? SJ: Actually, I couldn’t tell. I haven’t read this many books by English scholars (except one translation of Turnbull’s). As far as Japanese writers are concerned, only Kure Mitsuo‘s name whose book had been translated in French comes to my mind. I must confess that much of my humble knowledge comes from dictionaries and encyclopedias. OK: Have you found any significant differences in how French scholars approach Japanese history and culture versus what you see in English language works? SJ: I can’t really say. Most of the books I’ve read by French scholars are about cults, myth and religions. By the way, Musée Guimet’s Catalogue by Bernard Franck is one of the best introductions to Japanese Buddhist pantheon I’ve ever read. OK: Which era of Japanese history are you most interested in and why? SJ: I much like Heian and Edo periods. The Heian period for its heroic-fantasy flavor like in those Onmyōji movies, or Mizoguchi’s Tales of the Taira Clan (I also liked very much Yoshikawa Eiji’s book as well). And the Edo period, while many might find it boring, it interests me because it is easy to find data about this period. You can easily find which daimyo ruled what fief, how much time it took for a courier to travel from place to place, what was the price of things, and so on. All this information is precious and provides a lot of background material needed to create various characters in RPG or in LARP. I do very much like it when my players feel like their characters could have really existed. OK: Is there a particular persona from the Heian or Edo periods whom you would consider your favorite? SJ: Minamoto no Yorimitsu! When writing my book, I found it funny to run into him and his ghost busting Shitennō crew so many times, just because they’ve fought many yōkai: earth-spider, Ōeyama’s oni, Rashōmon’s oni. Even one of his Shitennō – super-strong Sakata no Kintoki a.k.a. Kintarō – is the son of a yamauba (mountain-hag). 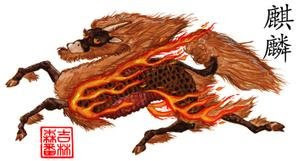 It seems that numerous Minamoto family members had a brush with yōkai-- Yorimitsu’s father fought an oni as well, Yoshitsune had been trained by tengu on Mount Kurama. Another one fought a nue that haunted the emperor. It’s an interesting family. 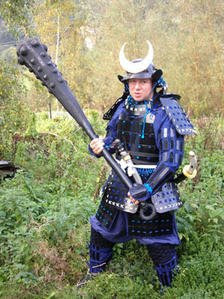 OK: You’ve made your own set of samurai armor, which looks really nice. What was your inspiration or who’s armor served as a model for your set? How did you make your armor? SJ: I’ve made this armor to be used in LARP. I took a huge PVC plate, and cut every part out of it. Then, I’ve drilled holes, heated those parts up in order to shape them the way I wanted, and varnished them black. The longest thing was to assemble all those parts. 70 meters of lace was needed for that. Do you have any new projects in the works—either in terms of your artistic talents or as a writer? SJ: I’ve written (and drawn) an adaptation of the classical Japanese fairytale Issun Bōshi (who meets two little fairies who strangely look like my daughters) that is being proposed to publishers. I’m also working on this Azuchi-Momoyama period role-playing game rulebook I spoke about in Tony’s interview. OK: You’re one of the more popular long-term members of the SA Citadel forum, but you don’t post as much as some of us would like. How can we get you more involved? Do you have any advice on any improvements we can make? SJ: That’s a good question. I often come to Samurai Archive only to read new posts. I like to write any helpful post when I can, but sometimes, your discussions go past my very knowledge, which is far than being a bad thing since it enables me to learn a lot of stuff. But soon, I’ll be able to talk with you about another topic-- Japanese dramas. Lately, my wife (my home computer specialist) showed that it was possible to see J-dramas thanks to the internet. I hadn’t had any opportunity to see a whole Japanese drama series… until now ! OK: Thank you so much for taking the time to allow me to interview you on behalf of the Samurai Archives. As always, it is a pleasure to converse with you. SJ: Thanks to you, too! OK: If forum members have questions for Sylvain, please place them in the comments section below by November 15.